At last the Andrew James company has released the ultimate Halogen oven with digital settings and a hinged lid. If it is as good as the previous Andrew James offering, it will be a world beater. I have been a strong supporter of the hinged lid variety of Halogen cooker since the idea appeared some years ago, the advantages are plain to see, it is so much easier and moreover SAFER to operate. That is both safer for you and from the standpoint of the hot element in the lid, which can be damaged if dropped. The previous oven from this company , was exceptionally well made and reliable. From the feedback already received about this new model, it would seem they have another winner! Andrew James have addressed the problem of the fragile element by making replacement very easy and by supplying a replacement free with the kit. On so many otherwise great halogen products from other manufacturers, this task has sometimes meant an untimely end, with the unit ending up in the bin. Not so with AJ Halogen Ovens. Please don’t get the impression that it happens every day, it certainly does not. In fact our original model Andrew James, is still going strong, with its first lamp perfectly intact, despite a camper van holiday in France and being lent to the scouts group a couple of times! As long as you don’t drop the cooker, it will serve you well. This was bought for my mother to replace another where the bulb had blown and could not be replaced. The main advantage of this was the fact that it came with a spare bulb which can easily be changed. After we received our Oven we firstly tried Jacket Potato’s from the book supplied they were perfect. We then tried a 3lb Chicken at the same time potato’s for roast they both came out to perfection we are so pleased with our purchase we should have got one years ago looks like most of the time our cooker is going to be redundant. This oven is so much easier than the one i had before and not as bulky, easier to handle, love it. I use it most days as it does exactly what I need. And if like me you are unfortunate enough to have it go wrong, do not worry as this company’s after sales service is the best I have ever had to use. 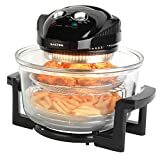 Undoubtably this Halogen Oven model is going to be a top seller, it has everything that we have been waiting for and a very good price. I am sure that even those who have been hesitant so far, perhaps because it was new or unknown, will now be confident to buy. In one respect alone, that of the handling of the hot lid, these improvements will attract many more customers to this cheap, speedy, economical, healthy way of cooking and with such tasty results. There is no doubt, the Halogen market is now maturing, with good reliable products and this model will be a world beater. can chips be made with the low level grill? Yes it can, but by a good margin, the best way to cook chips is to get the air fryer attachment, they cook fast and evenly. Also with the chips needing moving around for best results, it makes it really easy to do. How much does it weight? Can I buy new lamp after the spare one broke and from where? This is my 4th halogen oven & I wish I had opted for a non-digital cooker. The instructions are sketchy & the cookey book it came with is not very useful with a digital machine. I have tried the Internet,but no help there. Will have to persevere with trial & error again. Hi, If there is a specific query on the instructions I will try to help. The digital models are usually no worse to operate than the older dial types, but are certainly better when it comes to giving repeatable results with baking cakes etc. And …. no pesky numbers to rub off on the dials, which is a really common complaint. If you start off with settings applicable to a fan assisted oven, you won’t go far wrong. My next article is a conversion chart for standard recipes to use in the Halogen Oven, so I hope that will help you. There is no shortage of cookery books like Paul Brodels for example, on Amazon, you will see my favourite books in the side column on any of my recipe pages, all of which are quite cheap. They may even be available in Kindle version. Hi. I don’t like to push my opinion. However, this review helped me to decide to buy or not to buy the halogen oven. I did and since then I am a totally happy customer. Everything is cookable and there is no smell and extra oil. The family is happy and the food is more tasty. Easy to clean, faster to bake. Would advise to anyone. 1. Where to buy Andrew James premium Infrared Super Wave digital Oven/ Cooker with all the accessories advertised (high & low racks, Tongs, Extender Ring, Skewersx4, Toasting Rack, Baking & Steaming trays, Rice & Cake cooking dishes and Lid stand), and spare bulbs with an Air Fryer for 37.99 pounds sterling in Mauritius, UK or India. Is shipping free in UK & other places ? 2. What is the weight of the product? In the UK just use Amazon.co.uk order online from any of the links down the sidebar or on our product review pages. In my experience they do a super job of customer care getting the product delivered in one piece, on time, with easy payments online and if anything isn’t as it should be there is no fuss returning it. Weight information, if it was available when I reviewed the cooker, would be included in the review page. Just purchased one, can anyone tell me the best way to clean it? As the instruction booklet says press the sanitize button, but the buttons are marked as sterilise and clean! Don’t worry, it’s the same. The self clean aspect uses the swirling air current to whisk the soapy water round the bowl to get off the major cooking mess from the bowl. You’ll need to clean the heater head, by hand with a soapy cloth. The bowl can also be put in the dishwasher. One of the great features of the Halogen Oven is the high speed fan. Because it swirls the heat around so very effectively, the food is cooked evenly. This happens in all areas of the cooking bowl, as long as the food is open to this fast moving hot air. So yes, you can use the high and low racks together , as seen in one or two of the recipe pages on the site. Canadian household electricity supply is 120 Volts so a UK standard ( 220 volt) appliance is just not going to work , the display may light up but the element will not emit enough energy to cook. Will i be able to cook frozen ready meals that come in a plastic tray that is oven & microwave safe. i suspect that the settings to use is the same a fan oven am i right?. Correct. The Halogen is perfect for this range of ‘ready meals’ . Depending on the power of your oven you may have to reduce the time a little. Having said that, I find that some vegetables , mainly potato, used in these prepared meals, need slightly longer than the instructions indicate, I’ve had a few from Tesco recently that needed a good extra 10 minutes. How much power (amps) does it consume. I want to use one in my caravan? To get the current, divide the wattage of your oven by the mains voltage 220. So the average oven at 1400 Watts/220 is about 6.3Amps. Can i buy the andrew james digital cooker with north american electrical standards? I would lile to buy one but dont want to use an electrical converter..
is it cheaper than a microwave for a ready meal? Cheaper, no, but think about it….. The microwave ready meal has had to be specially packaged, it has probably more salt and sugar than is necessary as do most preprepared meals, wouldn’t you rather make your own from fresh ingredients, that you know are 100% additive free. The more I find out, the less I will buy ready meals, for example in the mediterranean , it has been shown many times that the Italians in the country regions live longer, have fewer health problems, like cancer and obesity and enjoy their food more. Why , well they grow the vegetables themselves, they prepare everything themselves, so they get a fantastic tasting meal, that the whole family can enjoy. No its probably not cheaper in a Halogen oven, but it cooks the food in ordinary everyday cookware, not special plastic microwave ware, it cooks just like a conventional oven, browning takes place, which it doesn’t in the microwave, making food taste right, look right and long term it will look after you AND your pocket. update: A recent ( 2017) medical study has now strong evidence that links obesity with cancer in later life. even more reason to abandon those ‘ready meals’ in favour of fresh, home made meals. Ok we are all busy these days, but especially if you make food in batches, then freeze them, it need not take too much extra time. Well its true that you only find out about after sales service quality when things go wrong. From my own dealings with AJ, i’ve been dealt with fairly and speedily, as have a number of users, from their own comments received now over quite a few years. I would always recommend a known brand over a supermarket product bought in a batch and sold with no thought given to after sales.